Otago’s state of emergency has been lifted. Emergency Management Otago this morning lifted the state of emergency which existed since deluges and heavy wind battered Otago’s eastern coast over the weekend. The region has now officially entered a recovery phase with teams moving on to assessing the damage and checking on the needs of those affected by the devastating floods. Emergency Management Otago group controller Chris Hawker, in Dunedin, said the move towards recovery did not signal any reduction in effort. The Dunedin State of Emergency was lifted at 9am today. Under the Civil Defence Emergency Act 2002 we are now operating under a Notice of Local Transition Period as we move into the recovery phase. The transition period is in force for 28 days (expires 9am 21 August) unless extended or ended earlier. The notice still gives the local authority powers to carry out essential emergency-related work. More information about the work happening as part of the recovery phase will be provided today. The work will be led by Dunedin City Council Recovery Manager Simon Pickford. A state of local emergency has been declared in Dunedin in response to issues arising from the heavy rain. Follow @DnEmergency for updates. Oamaru and surrounds are bearing the brunt of the storm, with widespread surface flooding and some homes flooded. There is surface flooding in Mosgiel, which is being closely monitored. Mosgiel people concerned about rising water can access sandbags and sand from the Memorial Park car park beside the stadium/Mosgiel Memorial Gymnasium. Sandbags are also available in South Dunedin at the car park behind St Clair Tennis Club, Victoria Road. Where possible, people should bring a shovel to fill the bags, although contractors are available on-site at both locations to assist with filling and loading. As a precaution the council has opened information centres in South Dunedin, in The Mercy Room, Catholic Social Services, 42 Macandrew Rd, and at Mosgiel Fire Station Theatre, 3 Cargill St.
Due to the weather the Dunedin City Council recommends all freedom campers find alternative accommodation rather than staying at either of the council’s two freedom camping sites tonight. NZ Transport Agency has issued road warnings for surface water and flooding across Otago, including SH1 from Waipahi to Waitaki Bridge. 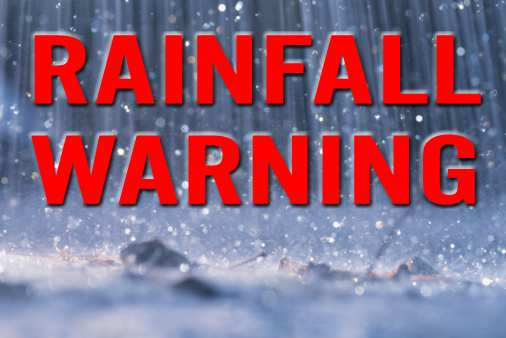 Warnings are also in place for SH88 from Dunedin to Port Chalmers, SH 87 from Kyeburn to Outram. SH83 from Pukeuri to Duntroon is also affected by flooding and is closed between Gray Rd And Horse Gully Rd. In Canterbury SH 82 Waimate To Kurow is closed. The Kakanui, Shag and Taieri Rivers, the Silver Stream, Water of Leith and the Lindsay Creek are all rising steadily. Flights to and from Dunedin Airport have been cancelled this afternoon. The cancelled flights include Air New Zealand flights to and from Auckland and Christchurch. The Jetstar flight from Dunedin to Auckland at 4.15pm has been cancelled. Air New Zealand is advising customers booked to travel to and from Dunedin to consult the arrivals and departures information on our website here for up to date schedule information. The Dunedin City Council has closed all sports grounds for the weekend because of the weather. The club rugby semi-finals may still go ahead at Hancock Park on Saturday depending on the weather. The decision will be made by the Otago Rugby Football Union. There are reports of power cuts in Oamaru. In Dunedin power has been cut to about 100 customers in Green Island, Fairfield and Abbotsford suburbs of Dunedin after a power line came down. Aurora Energy says it has a response crew working to fix the fault and power was expected to be restored by 5pm. The Dunedin City Council is encouraging all residents and businesses across the city to make their own preparations. Residents in low-lying areas who feel concerned should make plans to self-evacuate themselves to stay with friends or family who live on higher ground should it be required later on. Check on neighbours, particularly if they are vulnerable. Check grates near your house for blockages and keep them clear of leaves and other debris to avoid water building up and affecting your property. 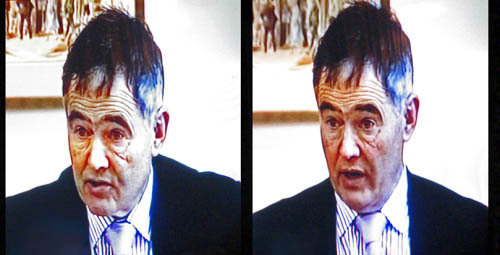 What has Mr Mayor achieved for South Dunedin following DCC’s mudtank/pump station fiasco – see 3 June 2015 FLOOD and his holus-bolus media pronouncements upon the Community of South Dunedin, their property assets and livelihoods. A brand new ratepayer-owned 2016 Hyundai Santa Fe was written off in a mysteriously “unreported” serious injury crash in the 2016/17 holiday period. His council is costing Dunedin ratepayers $20M+ pa to make the underutilised loss-making rugby stadium “work” (capital debt repayments and operational subsidies, see Intergenerational Debt). Continues major DCC spending spree on ‘nice to haves’ before addressing serious underspend on basic infrastructure (water and waste, roading). Without public explanation or consultation, presides over $100M being added to council group debt, as signaled in DCC’s LTP/Annual Plan 2017/18 projections. No prosecutions taken for the loss of 152+ DCC owned vehicles: Citifleet! Refuses to address council owned Aurora Energy’s programmed neglect of Otago’s power network, under the concerned regulatory eye of NZ Commerce Commission. Cr Vandervis was called a liar in public on three media-recorded occasions. Claims (media outburst) he is responsible for Jim O’Malley’s campaign to save the Dunedin Cadbury Factory. On it goes. —Meet bob the builder. Nelson Mayor Rachel Reese said in a letter to councils around the country she was nominated by Wellington Mayor Justin Lester and Matamata-Piako Mayor Jan Barnes. Dunedin Mayor Dave Cull is in the running to become the next president of Local Government New Zealand (LGNZ). Mr Cull’s only competitor for the role is Nelson Mayor Rachel Reese. The news of his bid came in a letter to the Otago Regional Council in which he asked for support. A letter from Ms Reese also appears in the council’s agenda, laying out her ambitions for the role. ORC chairman Stephen Woodhead said this week he expected the council would give its vote to Mr Cull. 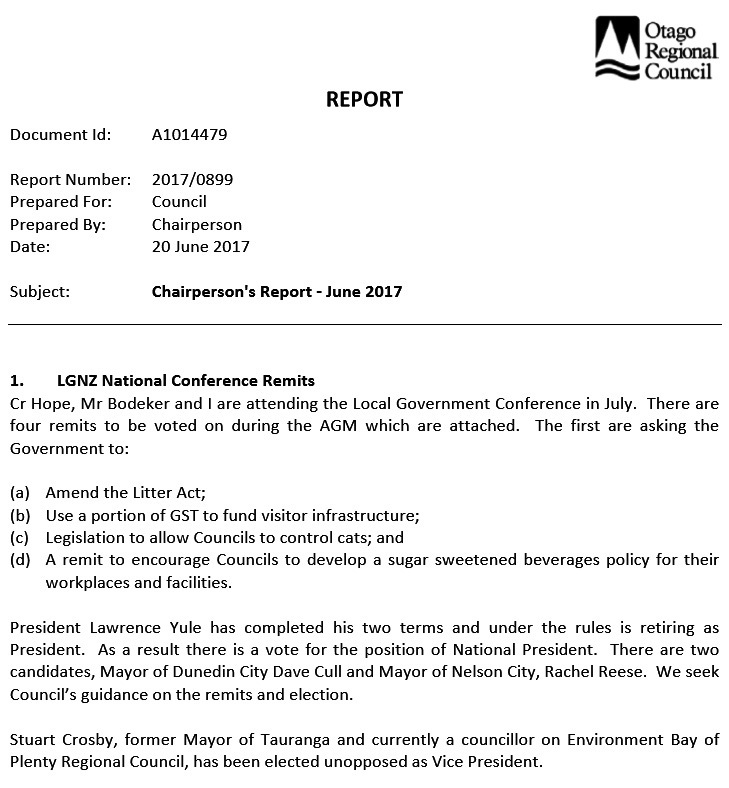 LGNZ represents the national interests of councils in New Zealand. The organisation provides its members with advocacy and policy services, business support, advice and training. 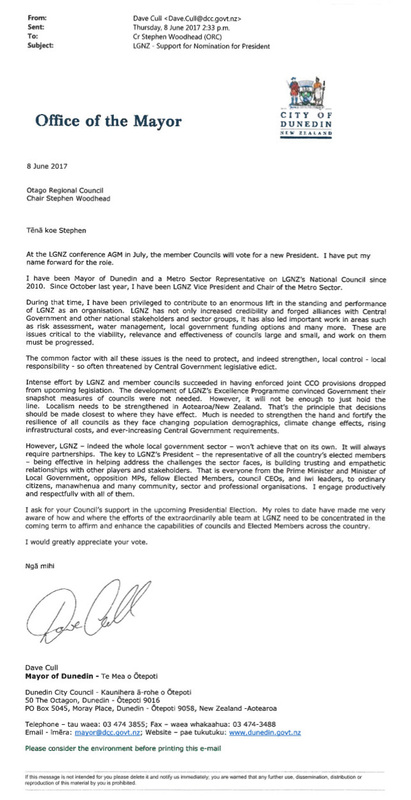 An LGNZ spokesman said an election would be held at the LGNZ general meeting on July 25, after an annual conference in Auckland, where the two mayors could present their cases. A pre-trial hearing for the defamation case brought by Cr Lee Vandervis against Mayor Dave Cull was held in June. This involved setting of indemnity costs (a not insignificant sum) before the case may proceed to a judge-alone trial. Not a jury trial. In a trial by judge-alone, the judge takes on the role of “fact-finder” (determining admissibility of evidence pre-trial). All the evidence is presented to the sitting judge and he or she is responsible for determining the facts and delivering the verdict. In a judge-alone trial the court is required to give reasons for its decision. In a jury trial, the jury is the fact-finder – that is, the jury is responsible for determining the relevant facts of the case and applying the law to reach a verdict of guilty or not guilty. The jury may be discharged from giving a verdict if it cannot agree. The role of the judge is to oversee and control the conduct of the trial in a general way. A jury is not required to and does not give reasons for its verdict. In hushed local terms, the ‘costs’ has meant some unrest between backers and their ‘party’. Public Meeting South Dunedin: It’s your future! Monday 12 June 6.30pm Nations Church. Please come! 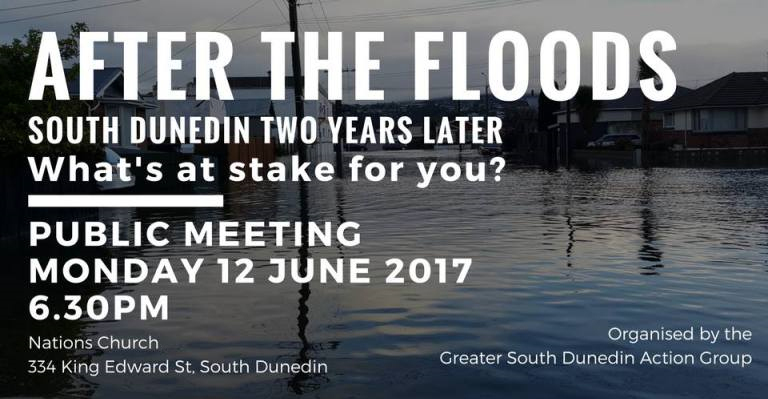 It’s almost two years since the devastating 2015 floods which hit the suburbs of Greater South Dunedin, affecting more than a thousand homes, businesses, community organisations and schools. It is timely to hold another public meeting in order to give you a voice and to provide an opportunity for some information sharing and discussion about the priorities for our community. We hope you will attend. There’s been a lot of talk about the future of Greater South Dunedin. Some of that talk has been muddled by poor quality information collected and published around the extent and causes of the flooding on our community. Eventually the Dunedin City Council acknowledged that its lack of maintenance of the mud tanks and its lack of oversight of the performance of the Portobello Pumping Station contributed 200mm to the flooding that occurred. Parliamentary Commissioner for the Environment, Jan Wright, warned earlier in 2016 that South Dunedin presented the “most troubling example” of high groundwater in the country. The DCC and the Otago Regional Council have produced reports on the flooding and the issues facing Greater South Dunedin due to rising groundwater and the impact of climate change. Their reports are largely based on predictions and modelling assumptions. There have been reports by GNS Science and the University of Otago’s School of Surveying of potential subsidence in South Dunedin and other parts of the city. At the time, GNS cautioned against reading too much into the subsidence data, as more work was required. The DCC has finally announced a temporary community hub will open at Cargill Enterprises on Hillside Road mid-year. After much public outcry, the South Dunedin Work and Income and Police station re-opened their doors. The DCC formed a stakeholder group of organisations and government agencies, some of whom have a presence in South Dunedin, which meets every month or so. Heavy rainfall over Easter demonstrated that the City’s civil defence preparedness and response has improved, although local people are yet to be fully informed about how they can be better prepared and understand how a civil defence emergency may affect them. The DCC’s Second Generation Plan has held hearings into the Hazard 3 (Coastal) Overlay which covers the area bounded by Forbury Rd to the west, Victoria Road to the south, the Caversham bypass motorway to the North and Portsmouth drive to the east. This includes a provision to require new residential dwellings to be “relocatable”. The DCC also recently announced new “minimum floor” levels for new buildings in South Dunedin of 500 mm for those not affected by the 2015 floods and 400mm above the floodwaters for those affected by the 2015 floods. This will result in some new houses having to be a metre above ground level in order to get a building consent. GIVEN THE DCC CONTRIBUTED 200MM TO THE 2015 FLOOD LEVEL THIS RAISES A QUESTION REGARDING THE NEED FOR ANY MINIMUM FLOOR LEVEL REQUIREMENT OR A CASE BY CASE EVALUATION AS THE NEED ARISES. If you live or work in the Greater South Dunedin area, all of these proposed changes and approaches affect you. Put together they provide a confusing picture of an important community which is receiving mixed messages about its future and doesn’t yet feel it has a strong voice and a plan. In all of the discussions about the future of Greater South Dunedin, the people who call these suburbs (of South Dunedin, St Kilda, St Clair, Forbury, Caversham, Caledonian, Portsmouth Drive, parts of Musselburgh and Tainui) home or work are not yet part of the discussions. 4. Dr Simon Cox: A geoscientist’s perspective on the problem at hand. 5. Mr Geoff Thomas: Property Council of NZ. Impact on property values. 6. Questions from the floor (if wishing to ask questions please try to write these down and direct them through the Hon Stan Rodger). a) That the meeting provide a mandate to the Greater South Dunedin Action Group to act as an advocate for the community interests. b) That the DCC are requested to provide an initial engineering plan and response by 1 December 2017 with the intention of providing protection and support to people, homes and businesses in the Greater South Dunedin area. c) The DCC be requested to commence the establishment of a community board to represent the interests of the Greater South Dunedin Community. 10. Final words from the Hon Stan Rodger. My father [never a follower of the FedUp Farmers, as he deemed them; always the campaigner for removal of farm subsidies, to enhance production and market competition] had ‘stock’ phrases with which to judge the faces of female adversaries, those with little brain or spine in politics, pretenders. One adept phrase that sticks in my mind is “like a horse eating thistles” —so I look on the following with my tinted lens, and laugh, rurally (ruefully). No one target. [DUD ‘money hype’ typically depends on false multipliers, anechoic silences, and arrogant self-belief —this (yes) bleak statement applies across a broad range of proposed deals and associated marketing detritus in the city, especially to events, conferences, sport, hospitality and accommodation, and even the re-use (Not conservation) of truly rare and precious instances of historic heritage] Here’s to all the fricking horses out there, including hypocritical colleagues and friends with blinkers like demo balls prepared to squeeze the last dollar and pass us to Hell. Anyway, back to “the business”…. cargo cult tourism. The wider effects of tourism are like those of dairying. Too many eggs in one basket and everybody (I mean, everybody) ends up doing it badly —killing Our Place for generations. Greed, like endorphins, like a running addiction, binds them up. They think they’re bright, they think they’re enablers (read risk takers/investors centred on their own gains only), they think they’re entrepreneurs, better than others (but because I for one will tell you things you don’t want to hear, you’ll say “I’ll ring you tomorrow”, that silence again) but they’re just funneled, tunneled sheepybaas – doing it wrong. Like cows, deer, Chinese gooseberries (Kiwifruit! ), wines, stadiums….. or ‘getting a room’ behind the poorly remembered, heavily made-up, Disney’d facade of our city and nationhood. The worst kind didn’t, or didn’t bother to, ‘grow up’ here. They get desperate, create mess, import other yes men. Ring you like nothing happened, their exploits —not to ask deeply madly who and how you really are. Next year’s Trenz conference in Dunedin is set to cost ratepayers $200,000, but the long-term pay-off should run well into the millions. The Dunedin City Council will next week be given an idea of the costs to the city of hosting the conference from May 7 to 10, and also the estimated benefits. The city learned last week it would host the tourism industry event next year, bringing up to 1200 international travel and tourism buyers, media and New Zealand tourism operators to Dunedin. It will be the first time the event, run by Tourism Industry Aotearoa (TIA), has come to Dunedin and the first time it has been hosted outside Auckland, Rotorua, Christchurch or Queenstown since it began in the 1960s. Trenz is an opportunity for New Zealand tourism operators to sell their product to buyers, effectively overseas travel agents who put together itineraries for overseas tourists. Attracting more than 350 buyers to experience the tourism products on offer here is considered a huge coup. On average, each buyer sends 4000 visitors a year to New Zealand, totalling 1.5 million. It comes as figures show New Zealand’s tourism market is expected to continue to grow strongly, topping $15 billion by 2023. Tourism contributes more than $690 million to Dunedin’s economy every year. Prime Minister Bill English says the Conservative Party’s new plans to clamp down on immigration will sting New Zealanders wanting to live in the United Kingdom, including on the traditional OE, but there is little he can do until Brexit is completed. The British party’s election manifesto includes plans to drastically cut net migration from 273,000 to less than 100,000 by targeting students and those on working visas. It proposes cutting the number of skilled migrants to get visas, higher levies on employers who take on migrant workers and tripling the National Health Service immigration health surcharge from £200 to £600 ($NZ380 to $NZ1130) a year for those in the UK on visas of more than six months and 450 for international students. That surcharge increase will also affect those on the traditional OE, although there is no mention of scrapping the two-year youth mobility visa which allows young New Zealanders to get a two-year visa to work and travel in the United Kingdom. Mr English said the changes would affect those on their OE but they would have to grin and bear it until Brexit was completed. NZME. OPINION What do Phil Goff and the Mongrel Mob have in common? As hundreds of travel industry figures from all around the world gathered in Auckland for last week’s Trenz conference, one of the many topics up for discussion was the Auckland mayor’s enthusiasm for a hotel bed tax on visitors to the city. Meanwhile, up north at Ahipara on Ninety Mile Beach, three German tourists were approached by two local Mongrel Mob members who told them that they were on Maori land, and had to pay koha. They also told the tourists they’d be taking a few of their cigarettes. A tobacco tax, if you will. Perhaps their plan for putting heavy taxes on visitors was inspired by the Super City mayor. Goff’s bed tax is about as blunt an instrument as the Mob’s shakedown. “Look there’s a foreigner! Let’s get a couple of bucks off them.” The airport tax introduced by John Key a year ago is equally clumsy. It’s a travesty that these tariffs are the best we can come up with for making money out of tourism. Yes, other countries put dull levies on visitor arrivals, but that’s no reason to follow suit. We New Zealanders pride ourselves on being innovators, so let’s find innovative ways to get more money out of the tourism sector. Both Goff and Key were ministers in governments that did everything they could to remove tariffs from the dairy trade. Today, the best and brightest marketing wallahs of Goff’s inner circle are putting forward a plan no more sophisticated than one devised by two Mongrel Mob members standing on a Northland beach. I’m not against making money out of tourists — quite the opposite, in fact. I think it’s terrific that our country can be boosted by an industry that encourages us to care for our environment, celebrate the things that make our culture unique and spreads revenue quickly and efficiently to the regions. But how about instead of putting a dumb tax on the visitors, we upsell them? Take their money at the gate for sure, but give them something special in return. Enough randomising. More rain and ice falls. Despite an extra $100,000 of spending approved this week, the Dunedin City Council scraped in under its self-imposed 3% target for rates rises for the next financial year. The council approved a budget that will see ratepayers asked for an extra 2.99% for 2017-18. Annual plan deliberations ended yesterday, after councillors spent a day and a-half discussing spending for the year ahead. The only major changes affecting ratepayers were an extra $100,000 approved for two projects, changes that came after staff found a further $100,000 in savings. […] Mr Cull said some people had reservations about the annual plan process, which featured feedback meetings rather than formal submissions this year, before full submissions are brought back for the long-term plan next year. Dunedin is set to get two artificial turf sports fields at Logan Park late this year or early next, after a proposal set to cost the city $1 million won unanimous approval yesterday. The move has delighted Football South, which had asked for the money to be provided urgently to attract available funding from Fifa. The Dunedin City Council annual plan deliberations meeting supported the proposal despite concerns from Cr Aaron Hawkins there had been no official public submissions this year, and others had been discouraged from suggesting new projects until next year’s long-term plan. The council moved the decision to give the strategy $200,000 to continue work towards making Dunedin a zero carbon, healthy environment. The environment, bus governance and pool admission fees dominated discussions at the first day of Dunedin City Council annual plan hearings yesterday. The absence of public submissions was a notable difference at the hearing. The public had a chance to voice their opinions on the 2017-18 draft annual plan at public forums and drop-in sessions from March 30 to May 1, rather than at annual plan hearings as in previous years. Dunedin’s environment strategy received 26 comments during the consultation. Mayor Dave Cull said the comments provided “a pretty clear response” about funding for the initiative. Chairman of the Otago chapter of the Property Council New Zealand Geoff Thomas says policymakers need to be careful not to damage property development opportunities in South Dunedin. Residential property development in South Dunedin could be “squashed” by the Dunedin City Council’s overly cautious natural hazards policies, the Otago branch president of the Property Council New Zealand warns. Geoff Thomas said a proposal under the proposed second generation Dunedin city district plan (2GP), to require all residential properties in the area to be movable, could stymie the replacement of housing stock. The proposed policy ignored costs associated with residential development, including land, compliance costs and construction materials. “Making residential housing relocatable doesn’t make sense. I, personally, have sold a 1980s house with aluminium joinery for $1 to be moved.” If approved, the proposal would result in either more substandard houses, or houses that would be “very expensive” to build, he said. The natural hazards policies did not adequately consider current and potential technologies to manage sea-level rise and floods. “I think South Dunedin is full of opportunity. A lot of the housing stock is from a day gone by. It is an opportunity to do something with the area and our concern is we don’t want to end up with a caravan park out there.” Water drainage was a clear issue. A more reasonable approach to protect the economic viability of the area could be taken to address it.